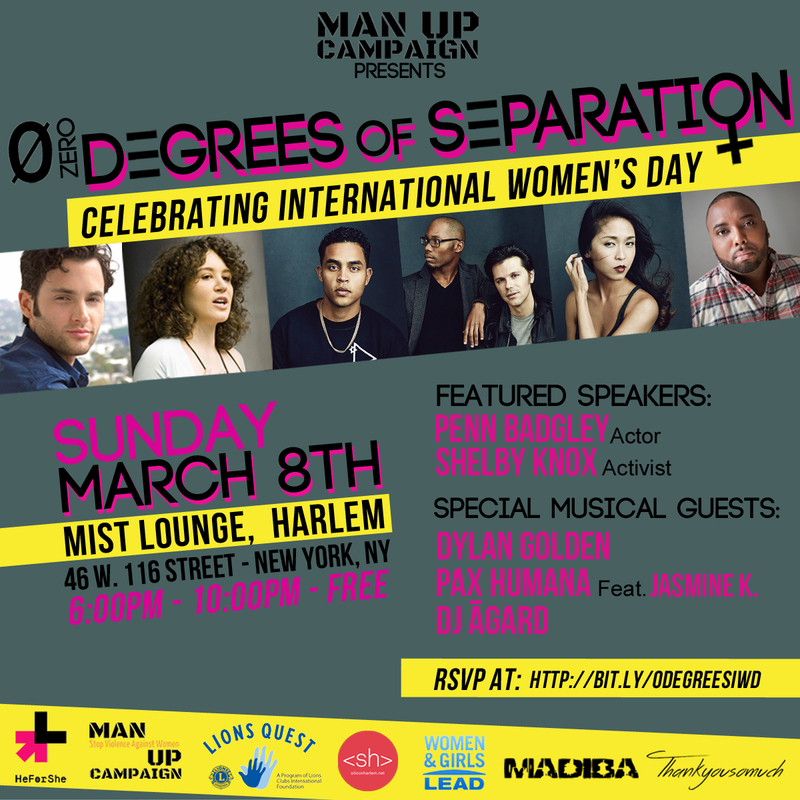 Queen Mother Dr. Delois Blakely, Community Mayor of Harlem and Goodwill Ambassador to Africa along with the Man Up Campaign invited the world to celebrate International Women’s Day in a high-tech club atmosphere and help kick off the United Nations’ historic Beijing+20 Conference in a memorable way! This International Women's Day was especially noteworthy, as it not only marked the twentieth anniversary of the seminal 1995 Beijing Conference on Women, and the 59th Commission on the Status of Women at the U.N., but also was the largest march for gender equality in America since 1978, and saw Man Up's announcement of the S.M.A.R.T. framework for life-cycle gender education, by Man Up Campaign. Man Up Campaign was thrilled to host Zero Degrees of Separation, an event that emphasized the interconnectedness, or "zero degrees of separation," among all human beings. It offered a unique convergence of place and opportunity, showcasing the work of Man Up delegates from Africa and South Asia in a spirit of celebration and inspiration. The festivities were held on Sunday, March 8 (International Women’s Day), at MIST Harlem, an innovative cultural and educational venue in one of New York City’s most historically significant areas. Queen Mother Dr. Delois Blakely, founder and president of the New Future Foundation discussed the journey from the 1995 Beijing Women's Conference 20 years ago to today. We heard from noted feminist organizer Shelby Knox, first introduced to most of the activist community via the award-winning documentary The Education of Shelby Knox, and currently Director of Organizing, Women’s Rights for Change.org. We also heard from popular actor and musician Penn Badgley, best-known to most audiences for his work in the television series Gossip Girl, but who also appears in the current NBC series The Slap and in the upcoming feature film Anarchy. Attendees had the opportunity to screen 2015 Sundance Film Festival selection The Mask You Live In. The music of Dylan Golden, Pax Humana, and DJ ĀGARD got everyone on their feet and dancing! Man Up Campaign was joined by Stony Brook University's Center for the Study of Men and Masculinity and Lions Club International to announce our new gender-focused, life-cycle engagement initiative targeting schoolchildren in India based on the “Lions Quest” social-emotional wellness curriculum. With your help we intend to extend the program globally to become the largest gender education program in the world.